Extremely durable: Can survive a fall or two without being damaged. Not among the premium brands but still offers exceptional functionalities at a fair price. Very simple to operate thanks to the layout & intuitive interface. From the chart above it’s clear: The MS906 is a force to be reckoned with where vehicle service and maintenance is concerned. Not only is it easy to use but it provides excellent coverage and works as advertised. Best of all, you get it at a fraction of the price. If you want to learn more about this product have a look at our review below as we unpack its diverse applications. Who knows: It might be exactly what you’re looking for to take your car repair business to the next level. Cars are very complex to deal with and you might need additional information regarding how to tackle a particular problem. 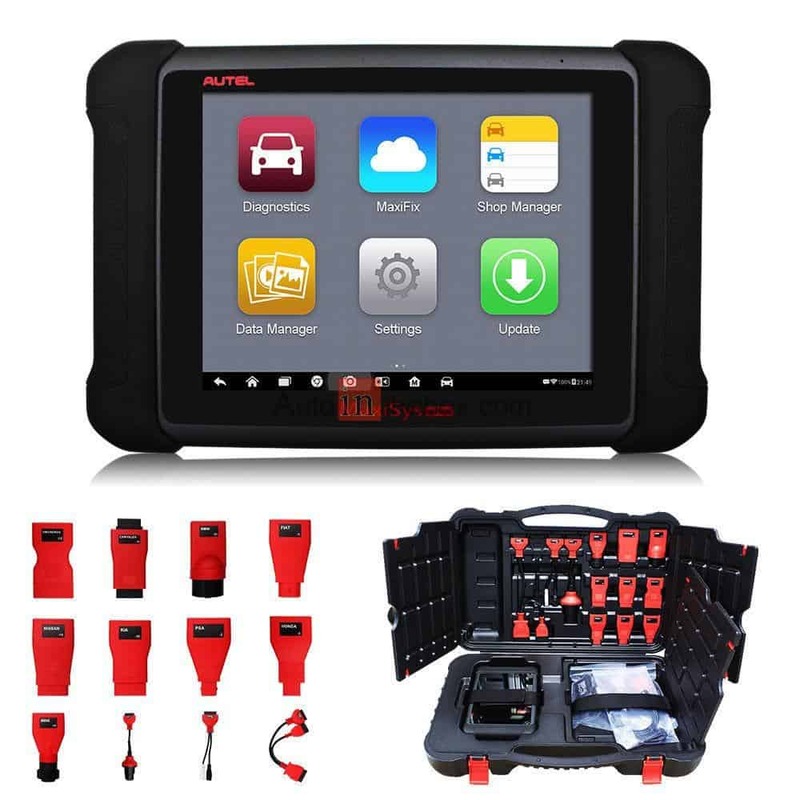 Autel understands this and that’s why this device has a cloud-based MaxiFix online community. Through this platform you can access a vast database with tips on vehicle repairing. This device allows you a free update after one year, following which you have to pay for additional updates. It’s covered by a 12-month warranty for any repairs you need. However the units come directly from China and aren’t covered by Autel USA which isn’t ideal for operational turnaround time. On the other hand, the customer service team is quite responsive thanks to the 24-hour email service if you have any technical questions. You’ll have direct access to the Autel Technical Support team for troubleshooting of diagnostic errors and bugs thanks to the interactive data logging sessions. 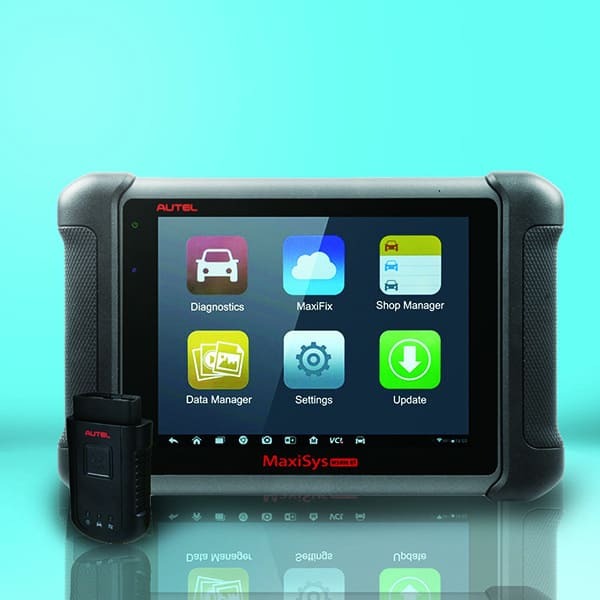 This is a must-have for any auto service shop looking for a scanner that does everything from diagnosing to analyzing vehicle problems. The only function it can’t perform is tire sensor pressure replacement but that really isn’t a deal breaker. Because of its problem-solving capabilities, it’s best suited for mechanics who deal with extremely problematic vehicles on a regular basis. Not only does it locate problems quickly, it enables you to rectify the issue accurately thanks to the data logging feature. This device features an 8” touch screen which displays clearly in HD. By utilizing the quad and dual core processor it offers quick diagnostic abilities. It runs on an Android operating system with extensive vehicle coverage and ECU coding capabilities. This model comes with a wide range of adapters to suit different vehicle makes and models as well as a durable hard case. The Bluetooth transmitter fits the standardized data port connector for your added convenience. You’ll like the built in 8MP rear camera which has autofocus plus a flashlight to inspect that vehicle engine clearly. The easy and intuitive navigation system ensures you find any information you need with utmost speed. Unlike other models which have a problem with the battery life, you won’t have that issue if you pick this unit. The built-in battery allows you to enjoy up to 14 hours of uninterrupted operation. This is a positive indicator towards efficiency and turnaround time during vehicle repairs. The package also includes a remote control to access tech support instantly from anywhere at any time. With this scanner you’re able to perform a range of services including coding and adaptation to mention a few. One of its impressive features has to be the Bluetooth functionality between the device and your Samsung tablet. This wireless long-distance communication allows for enhanced mobility resulting in increased efficiency. You can move around your workshop while connected to the car with this unit thanks to the Bluetooth feature. The automatic system allows you to get push message notifications via the internet in real time. For increased efficiency, this unit which offers one-stop multitasking capabilities. From customer information to data files, this device ensures all your vehicle records are easily accessible and organized. You can connect various accessories as needed thanks to the USB, auxiliary and audio ports for instance a digital inspection camera. For a device that offers a whole range of functionalities it’s pretty compact making it hassle free to carry around. You’ll like that this scanner is compatible with most vehicles; it has complete system coverage for different makes and models from the United States, Asia and Europe. To know the exact vehicle types it covers, visit the Autel website. Warning: It might not communicate with all makes and models even though they are listed as being covered by the system. This is no doubt one of the best scanners you’ll find on the market for the price. The rear camera is an absolute game changer because it allows you to see vehicle problems via video feed with clarity. It works just as well as the other more expensive brands if not better. Overall it’s a good product which is not only easy to use but provides a fast scan. End result—increased operational efficiency. Any low cost gadget which offers high end capabilities is worth investing in. Will you order one too?